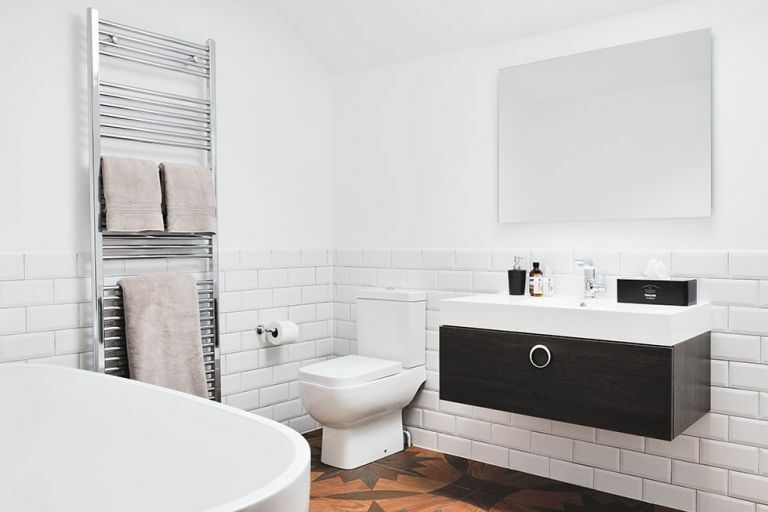 If you're designing a bathroom, take inspiration from Lisa and Llwyd's monochrome scheme, complete with statement flooring. The couple successfully transformed a small bathroom to a larger, more family friendly space with the addition of a large extension to their home. ‘Five years after moving into our home, and with our daughters Elian and Syfi growing fast, we decided that it was finally time to make the changes we’d had in mind when we first bought the house,’ says Lisa, describing her and husband Llywd’s decision last year to undertake a large rear and side extension to their semi-detached home. This included redesigning their small bathroom, with the intention of creating a larger room that was better suited to the five-bedroom property. ‘Everything was squashed into the tiniest space imaginable,’ explains Lisa. In order to include everything they wanted, Lisa and Llwyd worked out that they would need to double the size of the bathroom. As the extension was to also include a larger kitchen-diner, utility room and cloakroom downstairs, plus a new double bedroom upstairs, they were only able to allocate a small proportion of their budget to the bathroom, so had to keep a close eye on costs and plan effectively. ‘The rest of the building work was to be carried out at the same time, so we were able to incorporate the bathroom design and installation into that, rather than use a separate company for this part of the project,’ explains Lisa. After searching online for local builders, the couple made a shortlist of six firms to contact, and ultimately chose Project One. ‘No one else could match what the company was offering,’ says Lisa. The building process was a whirlwind of activity. ‘Project One directors Dorian and Babette Bowen oversaw the whole project, from digging the foundations of the extension to laying the carpets, so we were able to keep on track with timescales and also had one point of contact, which was helpful,’ adds Lisa. The building work to the whole house took 16 weeks, and during this time the family were able to stay with Llwyd’s father, who lives nearby. ‘Considering that it was such a large extension, it was actually completed in a short space of time,’ says Lisa. ‘Everything was so efficient, which, with young children, we were most grateful for. One of Lisa’s favourite features is a bespoke mirror that Project One created when the couple couldn’t find what they were looking for. ‘It’s backlit, so looks fantastic at night,’ says Lisa. ‘Initially, we were going to have a window in that spot, but we decided that it would be a waste of wall and window space as the glass would have been frosted. Instead, we added a rooflight, which ensures that the room is always flooded with light. Best kitchen worktops: granite, quartz, marble, laminate, glass or wood?